My long awaited book has been completed! Available both as an eBook or hard copy. The eBook can be printed out via your computer or read using Adobe Acrobat. 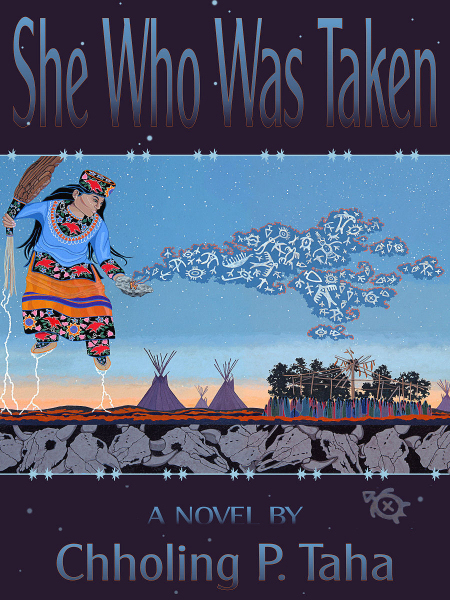 Run with the wind, hear the wisdom of the Star Ancestors, accompany Rosie Day as she re-discovers her heart, her culture and her place upon Turtle Island. There is a deep stain upon the golden summer prairie. The strange discoloration seems to have a heart beat unto itself. Is it a drum calling for the People? Swift sweet grass scented breezes flow down from the crest of a distant mountain. Smudge gracefully washes over the defect. Human blood now absorbed into the past, invisible, will arise and touch the future. Where does such strong energy go? Are you sure it is sleeping? That last vow, a former encounter or a strong intention, all will connect the Ancient with today. This is the hereditary dance of Rosie Day, a Métis, as she seeks out her Ancestors, discovers where her heart lives and reclaims her soul despite her adoption ordeal. For this young woman a no name person, the split in two heart stands before you. Her story begins at a birthing within icy embrace of a killing winter's gale. When the timing is right, she will travel back in time as the Wisdom Keepers prepare for the arrival of the rising red tsunami. These efforts awaken a child of the future. A sacred path expressing the undeniable hunger Rosie holds for her heritage. What is true human living upon Turtle Island in the 20th century anyway? Rosie's challenging journey reflects how life is but a woven robe. Each decision forms an appliqué to be sewn upon this blanket, her life. Rosie Day and her Mother Sophie tumble face-first into the ugly Shoofly gang. Perhaps those unresolved vows upon the prairies long ago will intertwine and weave within her life forever. No one or thing is ever truly forgotten. All this and much more races toward a final conclusion in time as Rosie Day stands at last within the entrance of the Sun Dance arbor. Kanadario 1 (Ontario Canada), once a complete universe, filled with hope. provinces, towns and private property, and of course the pitiful Indian Reserves. "Where has Joseph gone off to!" Sophie complained to the silent uncaring walls.